When we lose deleted files on our hard drives we tend to think of this information as unrecoverable. On a Wednesday afternoon it's easy to forget that those nightly cleanup scripts aren't going to do you any favors when you're looking to reuse some stock images for an updated web template. And those deleted music files? It turns out that you liked that dirty ol' garage band after all. In times of panic we resort to Google and often extreme utilities to scrounge our Macs for every last bit of recoverable data possible before sifting through the garbage of unreadable file names and Quick Look previews. We not only advise that you read John Gruber's advice on the matter and keep consistent backups, but we've reviewed a brand new Mac utility that's not only free during beta, it's really (really) slick. This application begged for my approval even before it slurped old image archives off my hard disk drive. Lots of juicy information is presented to customers before they have the chance to dig into the meant and potatoes, offering a beautifully presented tutorial that's just as fun to look at as it is to read. Even if you decide to skip this application blueprint, tons of useful information regarding time machine, secure deletion, and more is available on Disk Drill's parent website at cleverfiles.com. 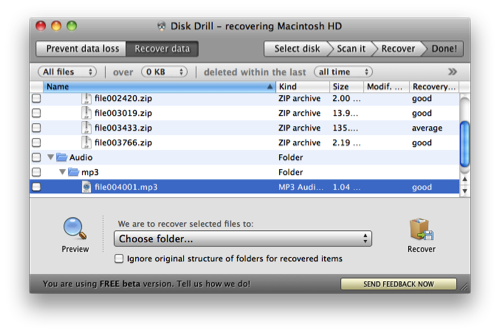 Disk Drill offers a solution to data recovery that I found to be interesting enough for a chin rub and a thumbs up. As the scruff on my beard understands it, Disk Drill offers a very cool features called Recovery Vault. Now this sounds scary because we typically think of vaults as places where we store data (I personally think this is a bad name for the feature), and I initially thought that the Recovery Vault was a separate garbage bin from OS X's trash. This isn't the case. 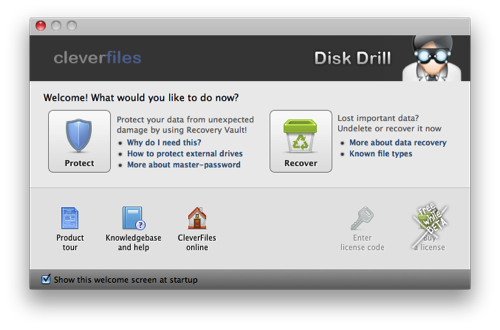 CleverFiles explain that Recovery Vault protects a hard drive by essentially keeping an index of your file's meta information. In an HFS and HFS+ filesystem, once you empty the trash, those files no longer retain their location, name, or any other associated data that can identify that file to the end user. Granted, the actual file is still available as written zeros and ones on your hard disk, and it's still recoverable if that deallocated space hasn't been written over yet. If a hard disk is protected by the Recovery Vault, Disk Drill monitors those changes and keeps a record of that meta information the HFS filesystem disposes of. So the next time you accidentally delete that end-game business file, Recovery Vault gives you a much better opportunity of finding that file (and much more quickly!) before it's too late. Pretty cool right? There's still a risk data will become unrecoverable, but you have a much better fighting chance. That's just the beginning of what Disk Drill can do. I had an old IDE drive lying around the house, and I decided to pop it an external closure and connect via USB to my Mac. The NTFS drive showed up, though it was unfortunately empty. I last left it reformatted, but I decided to try my luck. After about an hour and a half, Disk Drill was populated with images, music, old web archives, and an incredible abundance of data. Some of it was garbled, and other information was recovered partially. Though that may be enough to save your behind in an emergency situation. This application is pretty talented. Already I was in love, and I decided to do a deep scan on my own hard drive for shits and giggles. In fifteen minutes it had found over one thousand deleted images. One thousand! That doesn't even included deleted iTunes music, deleted Internet downloads, and even college drafts from earlier this semester. It felt really weird coming across all that old information. Some of the images I restored back to the desktop once I previewed them using Quick Look (Disk Drill gave me a warning that by rewriting the data I could destroy it, but I previewed anyway) just to see if it works well, and it does. 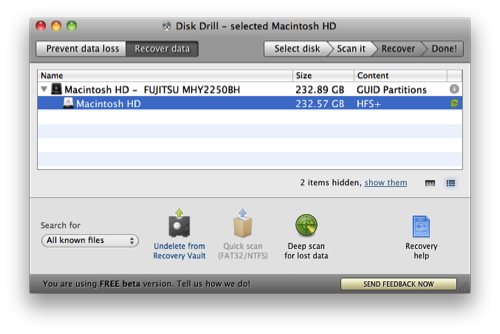 Turning Recovery Vault on my Mac's HDD did not hinder performance what-so-ever. I was kind of afraid of doing it at first since I'm working (on this article as a matter of fact), listening to music on iTunes, and subsequently downloading large files on the Internet. Folks, it just works. It took about an hour to finish, and Disk Drill doesn't bother you at all during the process. The little recycling (syncing?) icon goes from green to a shield to let you know that it's finished. 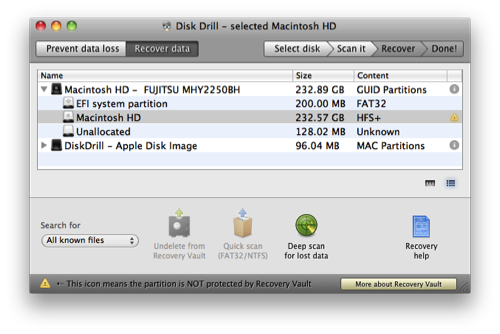 I really love Disk Drill's interface since it's clearly devided into two sections for protection and recovery. It's quite impossible to get lost, and Disk Drill offers an amazing (but not overbearing) number of prompts and cues inside the interface to help you find your way. Most likely you'll be able to jump straight in and recover those drunken Santa photos in a matter of minutes. My only complaint is that Disk Drill loves to coddle its users (much like one of those fancy Volvos that nanny you constantly). For the first run it's certainly helpful, but constant consecutive use may fray nerves as Disk Drill warns you about leaving discovered data behind for example. You're often asked whether you really want to do something without an option to stop reminding you, so it's kind of annoying at times. But for those one or two occasions where you'll really need to use it, you'll appreciate the helpful prompts. If you're using this app all day at a job or something, you'll be clicking either Yes or No a lot. The final verdict? This application definitely scored high on my "Fink approved" list of awesome Mac applications that you must install when you load up OS X for the first time. I really think CleverFiles has done a fantastic job making an intuitive recovery application for the everyday Mac user. After sitting down and playing with Disk Drill, it absolutely blew away my expectations. So how much does it cost? 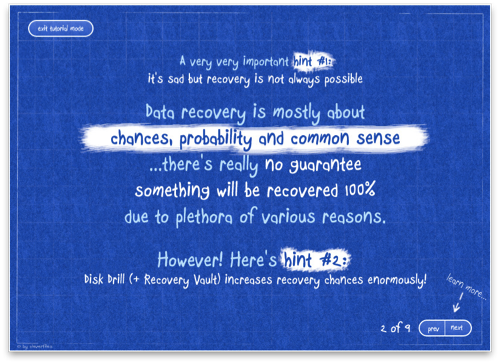 You could argue that having the ability to effortlessly recover your data is priceless. On that note, Disk Drill is free for you to try during this public beta period, and you can download it for free right now. Hurry on out of here folks: this is one Mac app you have to try. Leave your impressions in the comments below, and remember that CleverFiles is looking for your valuable input before launch.